Will Manchester United Sign Kalidou Koulibaly In January? There is a feel-good factor around Old Trafford for the first time in months following the interim appointment of Ole Gunnar Solskaer. After José Mourinho was relieved of his duties, the Norwegian has teamed up with Mike Phelan, Sir Alex Ferguson’s old assistant manager, to lead Manchester United into top four contention. After the demolition at the hands of Liverpool on December 16, Ed Woodward, the executive vice-chairman, was left with little choice but to sack the Portuguese manager. The mood among the players was at an all-time low, while their performances on the pitch had, somehow, worsened with every passing week. Not only was it the results that left United fans with a distaste for Mourinho in his third season, it was the style of football. Mourinho’s inability and lack of desire to change his ways and adopt a fresher and more innovative philosophy is what caused his undoing and has now paved the way for Solskjaer to mend the wounds. Solskaer is inexperienced at managing a behemoth club such as Manchester United, but he has impressed in the six years of managing Molde on and off, and will understand first-hand what level is needed to play for the Red Devils. He is, however, 4/1 with Betfair to be awarded the permanent job if he impresses over the next six months. While this appointment might only be valid until the end of the season, the Norwegian mentioned in his introduction to the press that he will be consulted throughout the January transfer window with who the club are actively pursuing. Mourinho made it quite obvious that he was in desperate need of a central defender and that is likely to be a priority position in the New Year, but only if they can attract the right calibre of player which will not be the easiest of tasks given the current situation they are in. Napoli’s Kalidou Koulibaly has been on United’s list for a few years now with reports suggesting the club tabled a £95 million bid for the Senegal international last summer. Aurelio De Laurentiis, the Napoli owner, has mentioned on more than one occasion how Koulibaly is his prized asset and is incredibly reluctant to sanction any sale - no matter the price. 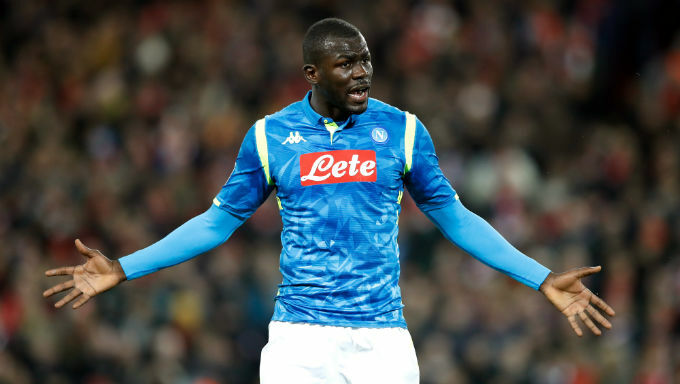 Koulibaly, 27, made the move to Italy over four years ago from Belgium and has not looked back since. He might have only cost £7 million at the time, but he has risen into one of the most feared and all-round best defenders in the world. It has been a long process from where he started to where he is now, but with Koulibaly in his prime, there is no wonder why so many clubs are queuing up for him. United’s defence has been atrocious this season and it is clear for everyone to see. Under Mourinho, they had a goal difference of zero after 17 games – with just under half the season already played. Conceding 29 goals before Christmas is an absolute travesty when you compare that with Liverpool’s seven, Manchester City’s 10 and Chelsea’s 14 after the same number of games. Solskaer will have some challenge on his hands in order to reinstate some defensive organisation within the ranks of United, but bringing someone as experienced and commanding as Koulibaly will only help matters. In Eric Bailly and Victor Lindelöf, United do have two younger players who are yet to reach their prime but have a lot of promise down the line – even if this season the former has not been given the chance to showcase it on a regular basis. Koulibaly, who is 9/1 to join United in the New Year with Betway, would bring a much-needed sense of composure and reliability to a United defence that has been run ragged this season. Partnered with one of Bailly or Lindelöf, the Senegal international would be able to omit some wisdom on his defensive partner and give United a steady foundation to build upon. The problem for United in trying to acquire Koulibaly is the uncertainty around the club at this given moment. Even though Mourinho has gone and Solskaer has come in for the short-term, players are none the wiser over who will eventually be brought in over the summer – although the bookies believe it will be Mauricio Pochettino – to steer the club for the next few years. It is a massive commitment from Koulibaly to leave a stable club to one that is still without a clear direction or structure in place behind the scenes, and that is perhaps why the odds are as long as they are. If, somehow, United do convince the player and his representatives that Old Trafford should become his new home, then Solskaer’s first bit of business in bringing a world-class defender to the club will only enforce his status among the United faithful.